Here's a funny story, Merv George Jr. says, leaning slightly forward in his chair and smiling. It's mid-August, George is just a couple weeks into his new role as the 13th supervisor of the Six Rivers National Forest, and his new office — the bigger one that his predecessor Tyrone Kelley just vacated to accept a new post in the regional office — isn't ready yet. So we're sitting in the office George has used as deputy supervisor for the past three years. The walls and shelves are still photo-bedecked: family, race boat, colleagues, events. George is looking relaxed in a patterned short-sleeved golf shirt and business slacks. "I'll tell you a funny story if you want to listen to it," he says again. "You want to hear it?" Back when he was chair of the Hoopa Valley Tribe, George says, he went to the White House for a conference on economic empowerment zones. About 10 tribal chairs and 40 mayors were at the deal, and at one point they were all waiting in a large room for Vice President Al Gore to show up and give a speech. George was chatting with Jerry Brown, who was sitting next to him — this was 1998, and Brown was mayor-elect of Oakland. George was saying it must be challenging to govern the city. Brown was saying he knew where Hoopa was and marveling at George's youth; George was 25, and the year before he'd become the youngest person ever elected tribal chair in Hoopa. "Then all of a sudden there was all of this pomp and circumstance and a 'Ladies and gentlemen, the Vice President of the United States!' and the doors swing open and here comes Al Gore," recalls George, his face alight with humor. "And he was just like the quarterback from Yale, the big man on campus. And as he goes around from table to table, he's actually — I mean he's a handshake bully! He's grabbing people and he's just jerking them around and, 'How you doing! I'm Al Gore!' And I want to say the average age of the people in this room was probably 60. And so I'm sitting here next to Jerry Brown, and he elbows me and goes, 'Hey, you're a young, strong dude. Don't let him jerk you around.'" Finally Gore was at George's table. "And I know what he's going to do," George says. "He had it in his eye. He'd raised his elbow and he was coming in for the shark attack. So I gripped him good and I nailed him, I nailed him hard — because I could hear his knuckles popping in my hand — Pop! Pop! — and I'm saying, 'Hi, Mr. Gore, my name is Merv George and I'm the tribal chair of Hoopa.' ... After he left, Jerry's like, 'Man, you got him!'" Brown took a photograph of it; the picture's hanging on George's wall, right underneath the one of him shaking President Clinton's hand later that same day. "I remember that he had the perfect handshake," George says of Clinton. "It was not too firm, but it was not too wussy. It was not too hot, and it was not too cold. It was almost like he had this thing mastered. And when he shook your hand and greeted you, he gave you the feeling like he was your first math teacher that you really took a liking to and you just hadn't seen him in a long time. He made you feel like that." George seems to monitor himself that way. He's not a tall guy, and a warm smile comes readily to his youthful, round face. But he's broad and muscular; in 2012, he bench-pressed 465 pounds, and now, despite injuries, he tries to maintain his ability to press at least 400 pounds. He could be very intimidating if he wanted. And yet when he greets you for the first time — and if you're not Al Gore or some other handshake bully — he grips your hand lightly but firmly as he looks straight into your eyes. It's the No. 1 rule of good business relations, mastering that handshake. In a metaphorical way, George also has been mastering the handshake between the two halves of his world — the tribal world of his family and ancestors and the non-tribal world in which he spent his schooldays — ever since he was a little kid at Lafayette Elementary School in Eureka trying to explain ceremonial Hupa regalia and dances to his classmates. Connecting, forging bonds among disparate leanings, communicating well — these are the skills upon which the now 41-year-old George thrives, and which he plans to employ generously in his new role as head of the Six Rivers National Forest. It's an important moment in the Six Rivers' history. George is the first Native American to be appointed forest supervisor of any of the 18 national forests in the agency's Pacific Southwest Region (which covers California and the Pacific Islands). He's the first local — with roots going back thousands of years, no less — to run the Six Rivers. And, countering the accepted agency tradition in which employees bounce around, gathering important posts for their resumes, George plans to stick around. This is his home. The 957,590-acre Six Rivers National Forest encompasses some of the wildest, most rugged, mountainous land in California's Pacific Northwest. It stretches long and narrow from the Mendocino County border with Humboldt north 140 miles to Oregon, taking in portions of six rivers — the Eel, Van Duzen, Mad, Trinity, Klamath and Smith — and landscapes rising from near sea level up to almost 7,000 feet. The Six Rivers also manages the adjacent Klamath National Forest's Ukonom Ranger District, which means the supervisor of the Six Rivers actually oversees more than 1 million acres. Six Rivers has wild and scenic rivers and endangered species, forests and grasslands, timber and grazing lands, recreational areas and wilderness. Nine percent of California's fresh water comes from the Six Rivers' 1,500 miles of streams. The region also enfolds numerous small communities, and overlays the territories of tribes whose people have lived there for thousands of years. Merv George Jr. descends from several of these local tribes. He's a member of the Hoopa Valley Tribe, and his father, Merv George Sr., is the tribe's ceremonial leader for the white deerskin dance and jump dance. George Jr. makes ceremonial regalia and helps lead ceremonies. His wife, Wendy George, who is Karuk and Hupa, is vice chair of the Hoopa Valley Tribe. Her parents are ceremonial dance leaders for the Karuk Tribe. She weaves baskets and makes ceremonial dresses (she and her husband both have studied their ancestors' regalia in museums, including the Smithsonian). The Georges live in Hoopa and have three girls and one boy. But George grew up in Eureka. Before he was born, his dad got laid off from a mill in Hoopa and took a maintenance job with the Eureka Public Works Department, where he worked for the next 30 years. George was born in Eureka and attended city schools. He loved math, football and track (as a Eureka High junior he became the county's 100-meter champion) and student government (being "in the throes of the decision-making process" thrilled him). He also played piano and drums and, at 16, started playing with his dad's rock 'n' roll band, the Merv George Band (he's still the band's main drummer). Every weekend, holiday and summer, however, George was in Hoopa with his relatives. There, like all the males in his family, he got into hydroplane and jet boat racing on the Trinity River (twice he's been a U.S. champion). And he learned his tribe's religious traditions. "My earliest memories were learning from my elders and being taught the lessons of what our dances mean and what our religious beliefs are," he says. "So I knew I was very different from the get-go. You know, these things were not what all my buddies in Eureka were doing. They weren't participating in jump dance ceremonies or white deerskin dance ceremonies." It wasn't always easy, he says. He remembers distinctly how, during a homecoming, one of Eureka High's classes hung a dummy of an Indian from its float. He asked them to take it down; they told him he was overreacting and that it just represented the Del Norte High School Warriors' mascot. Even some of his best friends couldn't understand why it bothered him, he says. "I remember thinking, 'Man, that's not right.'" But instead of letting the duality of his upbringing get him down, he says it made him realize something important about himself: He enjoyed being an ambassador. "Because it really made me uncomfortable to be so different from someone else," he says. "And you can do either one of two things: You can hide from that diversity of thought and shy away from it. Or you can just hit it head on and use it as an educational opportunity." He says traveling around with his dad's band, playing all sorts of venues — the Ingomar Club, the casinos, the Elks Club, the rodeo — reinforced the idea that he was meant to bring people together. "I talk to people," he explains, adding with laughter, "I'll talk your ear off if I sit next to you on the airplane; I'm the annoying person. And at break time or before and after the gigs, you get to hear what's important to people. You get a pretty good sense of what the politics and the issues are locally." After high school, he started refereeing youth sports. And he signed up at Humboldt State University, where he thought he'd study engineering. He was good with numbers and problem solving. But it wasn't social enough, and he struggled to get Bs. He was getting straight As in his Native American studies classes, though, and when the university created a bachelor's program in that field he went for it. He learned tribal history and tribal law, and soon took an interest in his own tribe's politics. At the age of 22, while still in college, George ran for a seat on the Hoopa Valley Tribal Council and won. He was the youngest council member the tribe had ever elected. Two years later, at 24, he became its youngest tribal chair. George admits he's a competitive person. In high school, an HSU football coach came to watch him play and agreed he was fast, but too small to play at Humboldt. "So all that did was it committed me to a weight room," he says. Three years later, he walked into HSU's weightlifting gym where the football players were hanging out and told the strength-training coach he could beat the record in the 185-pound weight class. George was in his street clothes — Levi's and a white T-shirt. The coach sized him up with a "really, now?" and said go ahead. "And of course I'd been lifting at home, so I kind of brought this rez strength kind of thing into this Forbes [Physical Education] Complex," George says. He broke the record for his weight class, bench-pressing 360 pounds. "The coach is like, 'Who are you, where have you been, why aren't you playing football, and can you run?'" He got to play. "And so it was a mental thing," he says. "Tell me I can't do something and I'll figure out a way to do it." George is driven to succeed, it's apparent. Even so, says his wife, Wendy, he always puts his family first, coaching the kids' softball, football and wrestling teams, and never missing any of their events or birthdays. This caring for others, combined with ambition, make him a natural leader, she says. "It's his comfort zone," she says. "We both thrive off of fixing things — creating policy and following rules and making rules that help programs and departments run more efficiently, and working with people to implement those plans." Leaf Hillman, 50, is director of natural resources for the Karuk Tribe and has known George all his life. The Karuk, Hoopa Valley and Yurok tribes share a number of traditions and their religious ceremonies often intersect. Hillman's family owns the rights to the Karuk's white deerskin dance; George's father is the Hoopa Valley Tribe's head ceremonial leader. And they've worked together on fish, river and fire management issues. 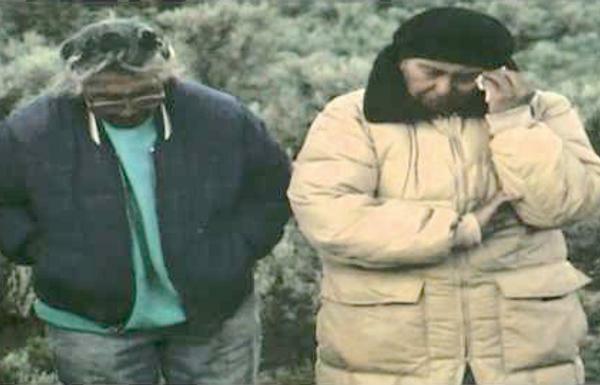 George was executive director of the non-profit Klamath River Intertribal Fish and Water Commission for almost nine years (after his four-year term on the tribal council), and Hillman represented the Karuk Tribe on the commission. And George was executive director of another non-profit, the California Indian Forest and Fire Management Council, and later became deputy forest supervisor just as the Karuk and Forest Service were wrangling over a collaboratively hatched Orleans fuel-reduction plan that went awry. "He's an easy guy to get along with," Hillman says. "He's easy to like, a lighthearted guy, open, honest, with good people skills and good management. ... He doesn't hold grudges." Former Six Rivers Supervisor Kelley agrees, and adds that George "can also separate the things he likes from what the community needs." He's also methodical, says Kelley. He makes checklists and works through them. He organizes his emails into folders. And his home files are as tidy as his office ones. Want to know where a Pacific Gas and Electric bill from 1995 is? He can find it in a snap. His zeal for organization, says his wife, is one of his best qualities. "Right down to his socks being perfectly matched up," she says. "And that's what makes him very successful. He returns phone calls and he doesn't leave anybody hanging. He's never late on a bill; his credit's perfect." "I take that really seriously," George says about his credit rating, laughing. "If I'm not up there close to 800 or so, I get really nervous." He's like his mother that way: Laura Lee George, who has an MBA from Humboldt State, works in the university's Native American program and was superintendent of the Klamath-Trinity Joint Unified School District. George is a bit of an anomaly in the Forest Service, apparently. According to studies, he says, the agency is populated overwhelmingly with people who are self-identified as being on the quiet side and like their office to "be out in the woods somewhere, or near a creek, near a lake." George recalls the time he and Kelley took personality tests as part of a supervisor-deputy leadership training. "Tyrone was off the charts introvert, and I was off the charts extrovert," George says, laughing heartily. But they worked, and got along, well together. George sold Kelley his Harley, and Kelley watched George's son play ball. Curiously, Kelley says, in meetings he was the one who "was quick to go in and establish our position," whereas George would listen more. "You'd expect the reverse from an introvert and an extrovert," Kelley says. He attributes his confidence to his many years of Forest Service leadership. George's Forest Service career has zoomed like a jet boat, putting him at the top of the Six Rivers in just six years. He started with the agency in 2008, at a whopping GS-13 pay level ("GS" stands for "general schedule," and the higher the number, the higher the pay). It's typical for a person with a bachelor's degree and some experience to start at the Forest Service around GS-7; it's not uncommon for a person with a Ph.D. to start at GS-11. His first position was the Pacific Southwest Region's tribal relations program manager, where he was the liaison between 210 tribes and the supervisors and resource managers of 18 national forests. In 2011, he became the deputy forest supervisor for the Six Rivers National Forest. And for a brief stint this year he filled in as temporary supervisor on the Lassen National Forest. Is he ready now to lead the Six Rivers? Absolutely, says Kelley. Among the biggest challenges facing the Six Rivers is managing an overly fuel-loaded forest where catastrophic wildfires are a constant threat. When George joined the Forest Service, the agency was just starting to shift its fire management policy away from wildfire suppression and toward ecological restoration. In conjunction, the agency began opening its arms to collaboration with other agencies and community and private partners. One example is the recent formation of the Western Klamath Restoration Partnership, a private-public group working to restore a million acres of historically fire-adapted (but long-suppressed) lands. "I think [George] is the perfect person to continue that dialogue because of his outgoing personality and how he really can develop and maintain relationships," Kelley says. "And, he knows the issues very well — salmon, spotted owl, landscape types. Even if he wasn't a tribal member, he'd be the right person." But his tribal connections help. Hillman, with the Karuk Tribe, most of whose territory is overseen by the Six Rivers, says George can see through modern politics to focus on the traditions local tribes hold in common. Tribal mistrust of the Forest Service runs deep, Hillman says, going back to the early days when the agency first banned many traditional and ceremonial practices, including the use of fire to improve crops and hunting grounds. The agency has only recently, slowly, begun allowing those practices. "It helps that we can [look at George] and say, this guy isn't going anywhere," Hillman says. "I know where he lives. He's got a family here. And he's going to be here a long time." George and his family moved away once, spending three years in Vallejo for his tribal relations job at the regional office. He loved the job, but they all missed home. Now he plans to grow old here. And he believes in the Forest Service's mission of "serving the greatest good for the greatest number of people over the greatest amount of time." He thinks it can do that in sync with tribes, rather than in opposition. "We're a conservation-minded organization," he says. "So we save things to use things. Which falls right in line with what tribes have done." George learned at an early age about the tensions between tribes and the Forest Service. In Hoopa, he'd hear people complaining about how the Forest Service wouldn't let them do traditional burns, or use their sacred sites. Back in Eureka, he'd pepper his youth football coach, Tony Montana, with questions. Montana was the only guy George knew then who worked for the Forest Service. "I'd ask him, or his son, Nick, nonchalantly, 'What is the Forest Service?'" George recalls. "And Tony helped give me a more balanced approach. ... What I think the future needs is a blend of current best management practices and modern science and laws, combined with some traditional ecological knowledge." He's looking forward to tackling that. And his main approach will be to improve communication. For starters, he plans to hold a series of meet-and-greets in the communities of the Six Rivers. This will encourage his staff, many of them those "quiet types," to interact more, as well as inform residents about the Six Rivers — about its many creeks and rivers, its campgrounds, its roads and wildlife. "I want to become better neighbors," George says. "I want to include more of our public in decision-making." Hearing all of this — George's success at virtually every endeavor, his rise through the Forest Service and his brash confidence — a person might wonder if maybe he is a little full of himself. But he likes to point out the things that have humbled him, too. He's hurt someone he loves. He saw two close cousins die in boat-racing accidents. And he's had three near-death experiences: a burst appendix at 14; a boat-racing crash under the Trinity River Bridge in Hoopa at 22; and almost blowing his own head off at 26 when he tripped while hunting. These, he says, taught him "what matters." "People matter," he says. "Feelings matter. Things that you work on to give back to others matter. Helping others. Leaving something better than when you found it. Sharing, that matters. Taking care of things and not taking them for granted matters. Family matters. Pride — pride really matters. Pain matters, and what you do with that pain." San Gabriel - Move over Pocahontas, Sacagawea, there is another native American that left her mark on American history. Few know of California's first woman rebel, Toypurina. Some scholars say she should be more prominent in the history book spotlight. "Toypurina is one of my Favorite women! She has an amazing story," said professor Rose Marie Beebe of Santa Clara University. "What you read in our book 'Chronicles of Early California, 1535 -1846, Lands of Promise and Despair,' is just the tip of the iceberg," she said. Although the book, published in 2001 is almost 15 years old, the information it shares is perhaps relatively new to most students of Early California History. This account of Toypurina and the true-life depiction of life in Early California dispels the idyllic notion of Mission Life and travels along the El Camino Real from 4th grade history lessons. Co-authored with her husband and fellow professor Robert M. Senkewicz, their work provides a rich detail of little known aspects of early life in California. This is especially so for all the history concerning the hundreds of native tribes that flourished in California before the arrival of the European. "Lands of Promise and Despair - Chronicles of Early California 1535 to 1846" by professor Rose Marie Beebe and Robert M. Senkewicz was published in 2001. It offers detailed accounts from transcripts and manuscripts of the early California period that is little known to most U.S. History books. Like this image "The person of Toypurina represents that early pre-European contact era very well," said David McLauglin of the California Missions Resource Center. "In fact, in some ways she's a bit like a 'Joan of Arc' type of figure, in that Toypurina really believed she was lead by supernatural powers to over-throw the padres and the conquistadors." Author and historian John J. O'Hagan mentions Toypurina in his book "Lands Never Trodden." He too said that Toypurina is a fascinating figure and a case study in the sharp wit and cleaver maneuvering of a determined young woman.Yet, more details are provided about this remarkable person in the 24th Volume of The Journal of The California Mission Studies Association "Boletin" No. 2 published in 2007. In the "Boletin" six historians provide detailed essays and study highlights on not only the life of Toypurina but also of Mission San Gabriel. They detail the circumstances that lead up to the failed revolt attempt against the Franciscan padres in 1785. And, the essays in the "Boletin" provide an account of what life was like before the Missionaries and Europeans arrived. Like most of the native tribes of California, the Gabrielinos (or Tongva) people to which Toypurina belonged were hunter-gatherers. They lived in small 'villages' of about 50 to 200 people, co-existing in harmony with nature taking only what they needed. As O'Hagan points out they were like most natives, "pretty much a peaceful people." Yes there were times they had conflicts but for the most part, they lived a simple, natural life. While they enjoyed the bounty which is and was California, life out in the open air with nature was not always ideal. This is one reason why tribes moved from spot to spot. "When one spot got too cold or too hot, or the tribe used enough resources there, they moved on to another spot." One way the native peoples would try to restore or replenish and cleanse camp spots was to burn the dead grass and foliage. That way new grasses and plants would sprout up next season when the tribe returned. Each of the scholars like Beebe in the "Boletin" explained, the Gabrielinos had their own sense of religion. This is where Toypurina got her strength in the resolve to go forward with the revolt against the padres at the Mission. Initially, well respected and in a way feared, "she was a shaman," said O'Hagan. And, as a religious-spiritual leader among her people she was trained in many of the ancient customs and beliefs of knowledge passed on from one generation to the next." In his essay, in the "Boletin" professor at Southwest University of Redlands, James Sandos, writes that as a shaman Toypurina had access to the power-elite of her tribe. And, that such a group spoke in terms and a language all its own. This was reserved only for shamans. She also understood many of the language/dialects spoken by the various tribes of the area. Her status allowed her to be taught and trained apart from the rest. Young though she was by today's standards, her training began very early and by the time she passed through adolescence to her early 20's Toypurina was already well-versed in her role and position. Even the Los Angeles Times in its "then and now" feature published back in 2001, noted that Toypurina was "no ordinary woman." Both O'Hagan and Beebe describe the transcripts of Toypurina's trial before the Spanish and Mission authorities. Her main reason for participating in the revolt was to reclaim the land that Mission San Gabriel was built on. When the Spanish arrived they subdued the natives, first by coercing them and then later by force. Conflicts with the Spanish usually turned bloody when the natives decided to fight back. What had began as a seemingly miraculous founding of Mission San Gabriel as the Franciscans see it, as described by Fr. Palou, in his account of the founding day, eventually turned bitter. A banner of Our Lady of Sorrows was unfurled when the natives sought to fight with the Spanish. But the painting bewildered them and according to Palou the natives "threw down their bows and arrows." Miraculous or not, the compliance of the natives did not last. Within a brief span of time, maltreatment and disrespect for the natives became common place. When the natives had sought to confront the Franciscans and the conquistadors with the intent to fight with bows and arrows, when the Spanish, unfurled the painting, the warriors dropped their bows/arrows. This according to Fr. Palou was what occurred at the founding the Mission of San Gabriel in 1771. The Spanish in their zeal for the expanse of a New Spain, treated the natives like children and beat them regularly. Usually a beating or shackling in chains was done at the Mission and it was routine for a padre to carry out the corporal punishment. For Mission San Gabriel the breaking point was when the conquistadors took advantage of native woman disrespectfully and in a violent way. It just so happened that one of the women in a particular case was the daughter of the chief of the Gabrielinos. When the chief was killed while trying to defend his daughter's honor, this set in the air the long-standing resentment the natives held for not only the conquistadors but also the padres. The Franciscans while mainly concerned with "saving souls," often overstepped the line between discipline and punishment. Even though the natives were not slaves, they were treated as servants and were expected to obey commands. If they ran away, they were brought back by soldiers. Adding to the resentment was the fact that the way of life the Gabrielinos had known was slipping away. The Spanish brought with them cattle, grains and customs that were in contrast to the hunter-gatherer way of life the natives had known for centuries. For example as Sandos noted, the natives way of burning camp sites to promote the growth of new grasses was banned by the Spanish. Cattle ate up the grass they had fed upon and new grasses and crops were introduced. And, with the establishment of Christianity in its Roman Catholic form, the tribes were forbidden to practice anything of their own religion. Ceremonial dances were forbidden, and their complex understanding of the spirit world was dismissed as superstition or at times as devilish. With tensions eventually escalating over time, the urge to revolt was eminent. And, Toypurina and others were anxious to attack. Word leaked out that a revolt was planned. According to official documents of the time, the revolt was squashed because a solider overheard some of the natives talking about the revolt plans and understood some of the dialect they had been speaking in. Toypurina thought her power as shaman would be able to over-power the padres. Once the Spanish learned of the plan, when Toypurina and her band climbed the walls of Mission San Gabriel, soldiers were disguised as padres waiting in the priest's quarters. When at trial, those caught along with Toypurina accused her of being the instigator, when in reality she was simply helping. Nicolas Jose, the one who sought out and paid Toypurina to help in the revolt, turned against her, as did many others. O'Hagan had pointed out that Toypurina was clever enough to 'convert' and negotiate her survival through the expecting of her new born son, whom she had baptized into the Catholic faith. A short time later she would marry a Spanish solider and become Regina Josefa. She lived out the remainder of her life as a Californio and part of Mission society, with her final resting place not at Mission San Gabriel but over 300 miles away at Mission San Juan Bautista. Some historians believe Toypurina was forced to convert and then live the life of a Spanish married lady. While O'Hagan and other historians like McLaughlin share some of that view, for no doubt Toypurina was caught. "It was still very amazing that she was able to express her feelings of anger at trial and manage to save herself from being put to death," said O'Hagan. Professor Sandos praised the scholarly work of Beebe and Senkewicz. He noted hers was "the absolutely best possible translation of the trial record. Rose Marie Beebe, is the best translator of early California Spanish period. All other attempts at translating the trial record are flawed," he said. Other historians speculate on whether or not she continued to practice her shaman skills or believe in the native religion. Even if that were true, the fact is recorded in Mission documents that she married and had three more children. While life as a Regina Josefa, a solider's wife, was perhaps not as exciting as warrior-shaman, Toypurina, her converted life was not without sorrow. Within six months after converting to Catholicism and having her first born son baptized (the child she was pregnant with during trial), died. Infant mortality rate during those times was very high. She had fought to try to save her people from the plight of the Mission life. Yet, in the end some see it in a way that she too was a victim of the Spanish influence. Her marriage to Manuel Montero while respected and blessed by the Church was as some historians point out, a life of banishment. For after the death of her first born infant son, as Sandos writes, "Toypurina's life, glimpsed fleetingly through the (various) Mission records, reads like an 18th Century Spanish version of a modern 'witness relocation' program." But as he pointed out to this reporter, "she followed her husband in his assignments; she was not banished. She was, from the Christian perspective, reborn in her baptism in Christ. She then married and followed her spouse." After leaving San Gabriel, she was then at Mission San Luis Obispo where her second son and first child born to Montero was baptized. Sadly, this son, named Cesareo Antonio died from a fall off his horse at age 31. In addition to son Cesareo, Regina Josefa had two daughters, Juana and then Clementina. When Clementina was baptized, Regina and her solider husband were at yet another mission, Mission San Carlos Borromeo in Carmel, California. As Sandos points out in his essay, the moving from Mission to Mission was not just a new life with Montero but a condition of the outcome from who Regina Josefa had been. Sandos also pointed out, "she feared for her life following the failed revolt, her people would not have subjected her to any kind of trial; she had already been through that in her plot to kill the missionaries from long distance and failed. "At that point anyone in the Tongva (Gabrielino) community was free to kill a failed shaman and all relatives of those who had been captured and punished would have wanted, and been permitted to do so in the revenge of killing her." But clearly that did not happen. She died at age 39 receiving the sacraments of Eucharist and last rights or anointing of the sick in 1799. That was just 14 years later after the failed revolt at Mission San Gabriel. It is hard to say if as Regina Josefa the spirit of Toypurina remained alive but hidden amid the Mission society life. But one thing is certain, she did live and was a unique and important figure of native women making a stand for their people in Early California history. For more information about Early California and Mission history visit the California Mission Resource Center web site. 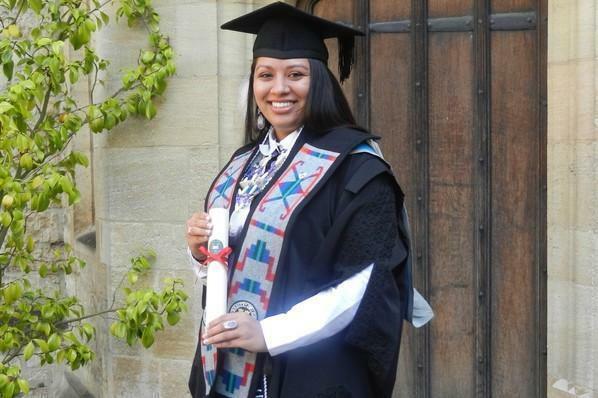 On September 22, Kelsey Leonard became the first Native American woman to graduate from England’s Oxford University. She’s a member of the Shinnecock Indian Nation of Southampton,New Yorkand graduated with a master’s degree in water science, policy and management from St Cross College, one of Oxford’s 38 colleges. August 27, 2014 | 6:14 p.m.
Iron Eyes Cody, who lived most of his life as an Indian, was very active in the Scouting program here in Glendale and often shared his knowledge of Indian lore with local groups. So, it was a surprise to many when a 1996 newspaper article said that Cody was not a Native American. Cody presented himself as an Indian, both in his private and public life. "Iron Eyes learned much of his Indian lore in the days when, as a youth, he toured the country with his father, Thomas Long Plume, in a wild west show. During his travels, he taught himself the sign language of other tribes of Indians," according to a 1951 unidentified newspaper article on file in Special Collections at the Glendale Public Library. The article said that the television star and his wife would appear at a Glendale Historical Society event to tell the story of the "Indian Sign Language in Pictures'' and would demonstrate Indian arts and customs. Plus, the couple would bring along their 3-month-old "papoose" Robin (Robert Timothy). All were to be attired in Indian regalia. His wife, a Seneca Indian known in tribal circles as Gayewas, was known in archaeological and ethnological fields for her work at the Southwest Museum under the name of Bertha Parker Cody. Iron Eyes Cody was preparing a book titled "Indian Sign Languages in Pictures," which he'd hoped to publish the following year, the article noted. Cody's background was revealed in a 1996 New Orleans Times-Picayune article stating that Cody was born to immigrants from Sicily. A profile of Cody, posted online on "Hollywood Star Walk" by the Los Angeles Times, said that, in 1919, a film crew used the family's Oklahoma farm as a movie location. Within a year, Cody's father had come to Hollywood as a technical adviser. He brought his family along, and Iron Eyes Cody soon got into show business. After touring with the wild west show, he returned to both act in and direct several "quickie westerns," according to The Times online report. Cody was already a celebrity when he became a supporter of the local Scouting program and he often taught Indian lore to Order of the Arrow members up at Camp Bill Lane. Area Scouts also made trips to his Moosehead Museum in his Atwater home. He was an adviser to the Northwest District Boy Scouts, a member of the Order of the Arrow and a life member of the Order of the Arrow of Verdugo Hills Council. Sheldon Baker, a lifelong Scout, recalled Cody's visits to Camp Bill Lane in a previous Verdugo Views (Sept. 26, 2013). 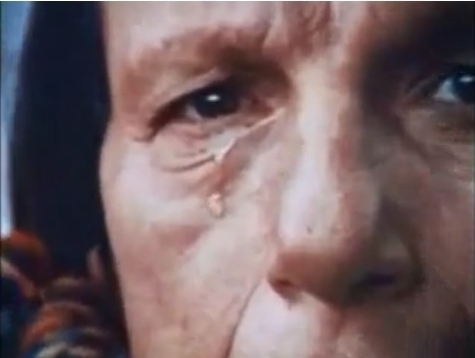 Baker said in a recent telephone interview, "When I was on the staff, Iron Eyes would come to the camp. Other times, we would visit him in his home." Baker has many fond memories of Cody, and said it really didn't matter to him whether Cody was of Indian background or Sicilian. "He was what he was to us, a friend and a good person," Baker said. "We didn't inquire into each other's background or ethnicity." Cody, who denied the 1996 Times-Picayune report when it appeared, died three years later and is interred in the Hollywood Forever Cemetery. "He lived and worked as an Indian for all his adult life; he labored for decades to promote Native American causes, and was honored by Hollywood's Native American community in 1995 as a "non-Native" for his contribution to film," according to an article posted on the IMDb website. The woman who was the driving force behind the cases that led the U.S. 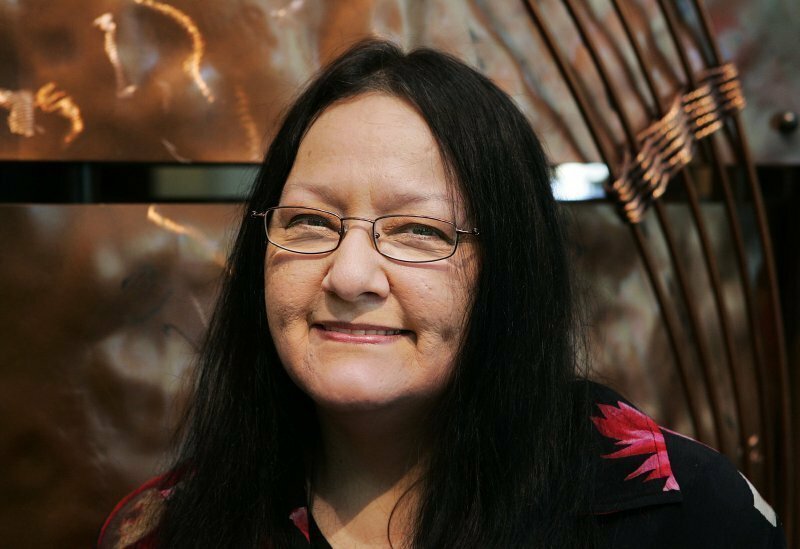 Patents and Trademarks Office to cancel the federal trademarks for the Washington Redskins Wednesday is 69-year-old grandmother and longtime Native American activist, Suzan Harjo. "Suzan has been fighting this since 1992. Native American people have been fighting this since 1972. ... The reason it has come up recently is because Suzan has worked really hard to bring this in the public eye," Amanda Blackhorse, one of the five Native American plaintiffs in the case filed before the Trademark Trial and Appeal Board, told Business Insider. "She's just a tremendous woman. She's a strong Native American woman, and I'm so happy to have met her and to have been a part of all this because this is what we need to do," Blackhorse added. Harjo was born in Oklahoma and is of Cheyenne and Muscogee ancestry. In a conversation with Business Insider shortly after the U.S. Patents and Trademarks Office's decision was announced, Harjo said she became involved with political activism while she was still in school. At 8 PM Eastern tonight (June 7) on Free Speech TV, the documentary American Outrage will have its television premiere. The film tells the story of the Dann Sisters, who fought the U.S. government, specifically the Bureau of Land Management, beginning in 1973, over their right to farm on land that is theirs by treaty. American Outrage was directed by Beth and George Gage, and is narrated by Mary Steenburgen. HOW TO WATCH: Free Speech TV is channel 9415 on Dish Network and channel 348 on DirecTV. It is also available on Roku, and the website freespeech.org carries a live streaming feed of the channel as well. For more information on the Danns, read ICTMN's obituaty for Mary Dann from 2005. Amos Tripp, Karuk spiritual leader and Tribal attorney, shares his wisdom about survival and cultural revival. After leading Aquinnas High School to the Wisconsin State Basketball Championship during his sophomore year in 2011, Bronson Koenig, Ho Chunk Nation, was scouted by ACC powerhouses Duke and North Carolina. But Koenig he’s a La Crosse, Wisconsin native, and signed with the University of Wisconsin Badgers last year. For years I have thought that most of the problems of Indian Country would be solved if people had jobs. I still believe that. Lance Morgan is the embodiment of that concept. In a conversation I had with him two weeks ago, Lance confirmed what I have long suspected. The tribally owned company he runs, Ho-Chunk, Inc., is highly successful because it has toed the line and been committed to success. It has followed the capitalist line, to make money first. But it is more than that. The non-Indian business is in place to make money, Lance says. The capitalists worship the dollar as their almighty Grail, he said. At Ho-Chunk, however, the emphasis is on impacting the community. 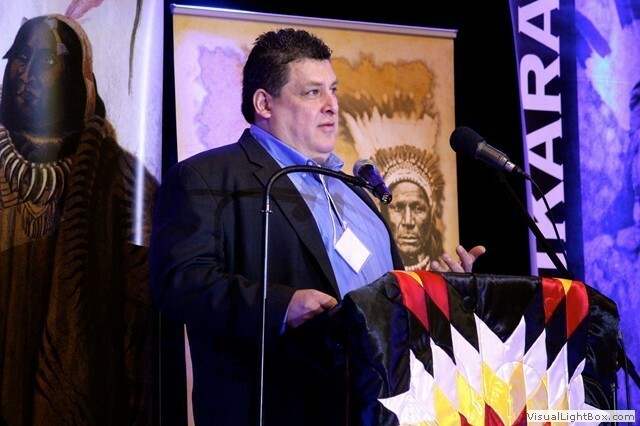 Using that philosophy, he and his team have built Ho-Chunk into the largest company of the small tribes. He says some of the larger tribes have larger companies. But Ho-Chunk grossed $259 million last year—a significant amount in anybody’s books.